New range of BMW 3-series (factory index body E36) appeared in November 1990. All the advantages inherent in the predecessor (E30), survived and even multiplied in the new family. The designers managed to find a modern and dynamic image (CX=0,29), and the design of the front of the car was later called "automobile face 90-ies". The characteristic appearance underlines the power and dynamics of corporate style BMW. The BMW E36 cars were the best in the mass segment in time thanks to its excellent body Assembly (with six-year warranty against perforation corrosion), high-content interior finishes, a wide range of in-line petrol engine and excellent handling. The first were produced 316i (102 HP) and 318i (l.with.) with four-cylinder engines, 320i (150 HP) and the 325i (192 HP) - with new 24-valve "six". Elegant appearance auto hid sizes and nearly 200 pounds overweight - retribution for passive safety. However, despite the "completeness", cars with four-cylinder engines are still a little inferior to the predecessors in acceleration, but surpassed them at maximum speed and efficiency. As a BMW 325i developing a maximum speed of 233 km/h, accelerates to 100 km/h in 8 seconds, ahead lighter its predecessor. A new multilink rear suspension made the BMW 3-series is more comfortable and easier to manage. Convertible and wagon some time remained from the old lineup. Since October 1991, began selling economical but high-spirited 325tds turbodiesel variants (8,9 l/100 km in the urban cycle). In January 1992, at the salon in Detroit to debut a new two-door coupe BMW 3-series E36 Coupe 320i (150 HP), 325i (192 HP) and M3 E36 Coupe (286 HP). Despite the resemblance with the sedan, these cars do not have the same external body parts or glass. The roof of the coupe to 130 mm shorter, hood is 80 mm longer and the car 50 mm below. In September of the same year the six-cylinder engines received the control system camshaft timing VANOS for the intake valves, making them more economical and better traction. In March of 1993 in Geneva presents a convertible BMW 3-series E36 Cabrio. The car has a very high level of security - there are candidates for overturning the headrests. Easily removable aluminum top was offered as an option. In October 1993 instead of a diesel engine displacement of 2443 cm3 (324td) started to issue new high-speed turbo diesel volume of 2.5 liters capacity of 115 HP (325tds) and 143 HP (325tds), which was first equipped with an intermediate air cooler (intercooler), as indicated by the letter "s" in the model designation (same is true for other diesel models of this generation). The maximum speed of the BMW 3-series E36 Sedan reaches 214 km/h. In February 1994 began production of three-door hatchback Compact with an economical four-cylinder engine working volume of 1.6 liters (102 HP), 1.7 l (turbo diesel, 90 HP), 1.8 liter (115 HP) and 1.9-liter 140-horsepower 16-valve cylinder head. To reduce the cost of these cars they were made with simple conventional suspension. Five-seater Compact is a fairly practical car for those who are not concerned about the transportation of things. In August 1994, the Bavarians released the 4-cylinder turbo-diesel engine displacement of 1.7 liters and output of 90 HP (318tds). 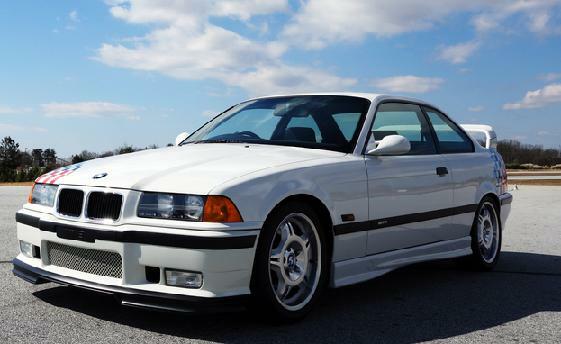 Then new E36 M3 with the 3-liter "six", which develops 286 HP, sedan and cabriolet BMW M3 E36 Cabrio go on sale. In January 1995 there was a model 328i (2.8 l) with (for the US market retained the old cast iron block) with a capacity of 193 HP, replaced the 325i (2.5 l), which strengthened the position of BMW in the sector of economical sport models. The long-awaited wagon (BMW 3-series E36 Touring), absent in the production program of the year, was presented in may 1995, when the premiere model 323i is equipped with the latest aluminum row "six" working volume of 2.5 liter capacity 170 HP, briskly taking the start and "outstanding" hundred in only 8, and even faster BMW "328i" (193 HP). Capacity for a compact wagon is not the most important thing, more important than the image. The capacity of the trunk was only 1030 L. the change in the index of the model with 2.5 l engine from 323i to 325i due to the fact that the new inline 6-cylinder engine with an aluminum block developed less power compared to "iron" predecessor - 170 HP vs. 192 HP, so that clients do not think that over the years the motors get worse, the index of the machine "dropped." In September 1995, the Bavarians have updated the BMW M3 - brand tuning from "BMW Motorsport". The new engine 3.2-liter (321 HP), coupled with a manual 6-speed gearbox helped to reduce the time to reach the mark of 100 km/h to 5.4 seconds! The car's appearance has changed in 1997: additional exterior colors and upholstery, traction control system fitted as standard to six-cylinder petrol cars, heated aspherical mirrors, side repeaters and indicators... the new design of the grille. More "got a BMW M3 on request it is possible to install the latest development of the company - mechanical 6-speed automated gearbox type SMG (Sequential M Gearbox), which is a mechanical gearbox with a hydraulic actuator-switch and electronic control, which allowed to drive on an automatic transmission and with manual switching without a clutch pedal - it is simply missing. Compact has got the same 6-cylinder engine of 2.5 liters (170 HP) - 323ti.